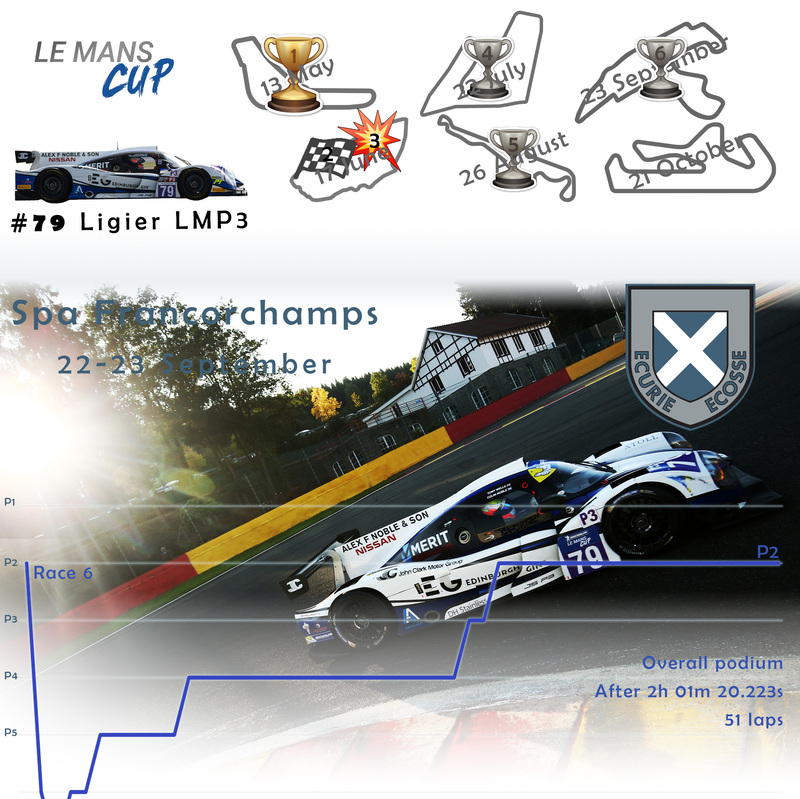 Ecurie Ecosse continued their podium streak in the Michelin Le Mans Cup at Spa Francorchamps at the weekend (22-23 September) as they notched up another second position to all but confirm the runner-up position in the championship. Tony Wells and Colin Noble teamed up once again in the #79 Ligier LMP3, recording the third fastest time in both of the free practice sessions. With just 15 minutes of qualification, Wells put in a hot lap good enough for a start on the outside of the front row. Race day saw Wells make a good start, but found himself pushed wide on exit for the La Source hairpin. With wheels on the astroturf on the outside of the corner, Momentum was lost and on the run to Eau Rouge, Wells dropped to sixth position. Undeterred, Wells pushed on, picking up two positions in his stint before pitting at the end of his 25th lap and handing over to his teammate. Noble was immediately right on the pace, closing down a significant margin to move third ahead of the #4 Cool Racing Ligier and then up to second passing the RLR MSport entry with 18 laps remaining. With the leading DKR Engineering car leading by a minute by that point, Noble managed the gap to those behind to record yet another podium position for Ecurie Ecosse. 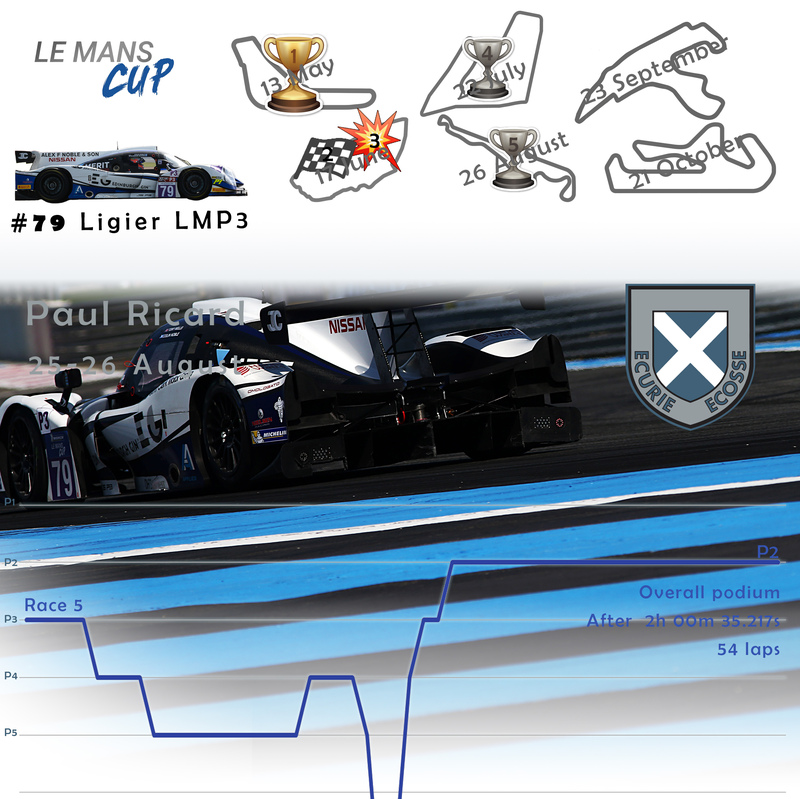 Ecurie Ecosse now prepares for the final round of the championship which takes place at Portimao, Portugal 20-22 October.